• Blondi’s Bistro Marwayne Pg. 79 • Crimson Creek Café Redwater Pg. 37 • Java Blossom Viking Pg. 107 • Sacred Arts Camrose Pg. 121 • Timber Café Lloydminster Pg. 98. 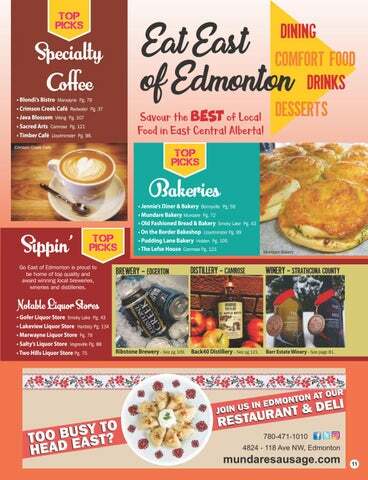 Savour the BEST of Local DeSSeRTS Food in East Central Alberta! Go East of Edmonton is proud to be home of top quality and award winning local breweries, wineries and distilleries. Ribstone Brewery - See pg 109. Back40 Distillery - See pg 121. Barr Estate Winery - See page 81.